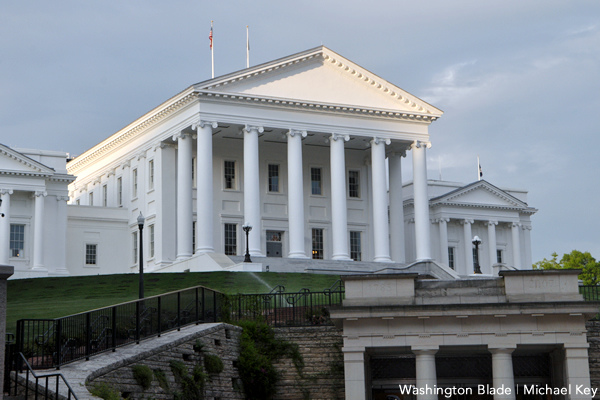 A Virginia House of Delegates subcommittee on Thursday killed four pro-LGBT bills. Members of a House General Laws Committee subcommittee killed state Del. Mark Levine (D-Alexandria)’s House Bill 401, which would have banned discrimination based on sexual orientation and gender identity in employment, public accommodation, housing, banking, insurance, public contracting and apprenticeships. The Virginia Senate last month approved SB 202 and SB 423. The committee on Thursday was also expected to vote on state Del. Elizabeth Guzman (D-Prince William County)’s House Bill 971, which would have added gender identity to Virginia’s Fair Housing Law. The Prince William County Democrat asked the committee to remove the measure from the docket. The vote took place three days after Equality Virginia held its annual Lobby Day in Richmond. Gov. Ralph Northam, who spoke at the annual event, last month signed an executive order that bans discrimination against LGBT state employees. Equality Virginia, HRC and Freedom for All Americans on Thursday noted this directive in their press release. A House subcommittee on Tuesday tabled state Del. Debra Rodman (D-Henrico County)’s House Bill 1466 that would have banned health insurance providers from discriminating against transgender policyholders in Virginia. State Del. Danica Roem (D-Prince William County), who is the first openly trans person seated in a state legislature in the U.S., was the measure’s chief co-sponsor. It’s always the Republican party killing pro-GLBT legislation! That’s why we rightfully label those that support that party and Trump idiots!